Death is such a dirty, rotten thief and scoundrel - sculking around to steal those who live liveliest, and who have so very much to lose. Like Claudia, who leaves a devoted husband and two children to mourn her. I just caught word an hour ago that Claudia passed away yesterday. I feel immensely sad. I had just been asking my friend about her on Tuesday. My friend called her immediately after we hung up but apparently there was no answer. Said friend feels terrible that she got caught up in her own busy life this past month. And I feel that ache of regret at not having performed a random act of kindness for virtual strangers, as they juggled Ricardo's travel, her sons' soccer, plus Claudia's hospice and homecare scheduling challenges. You see, Claudia and I were barely acquainted - she was the friend of a friend, as was her son and Holy Son - who also share a mutual close friend. I would see her at church only occasionally because she tended to go to the earlier service. The last time I saw her, she was sitting in front of me in church during the later service, flanked on either side by her two young boys. She seemed well enough, but cancer is an evil shapeshifter like that. Despite or more to the point, because I barely knew her, I found myself quietly lurking on Ricardo's blog - sharing vicariously in the pain and suffering of her illness and his narrative, which he so eloquently and honestly revealed to the world. And though she never knew, she touched my life. Her courage and strength as a wife and mother, in the face of terminal cancer, both terrified and inspired me. I cannot even begin to imagine how she was able to project such grace, resolve and what looked suspiciously like a whole lot of, but was likely the mask of eventual acceptance born of serenity prayer embodiment. Ultimately, she did wage a pugnacious and feisty battle against the cancer. She beat the odds and borrowed a handful more days and weeks cards than Death and Fate originally dealt her. And so in honour of Claudia's tenacity and timeless Spirit, I will place a small inukshuk in the memorial garden at church this Sunday. And while it may sound cheesy and perhaps sacrilegious, I'm going to finally get around to going to see The Bucket List this weekend and updating and notarizing our bloody will, which hasn't been touched since before the birth of my daughter. Death has a way of doing that - sounding that universal gong to get your schmidt together and live large, because life, she is is short-statured. Claudia's service isn't until next Saturday - Holy Son and I will attend. It will be our first UU memorial service and a huge departure from the last service we attended three years back - which was Russian Orthodox and more than a little glossolalic and unorthodox sounding to this Orthodox tradition neophyte. I anticipate next weekend's service being a beautiful tribute to her life and spirit. As below, so above. 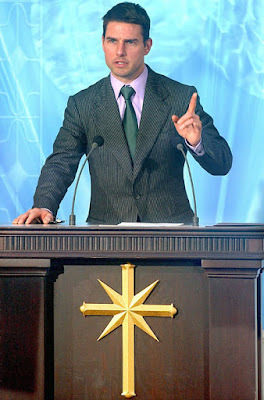 Did you watch the leaked Tom Cruise Scientology video this week and marvel at his vanity, his vacuous verbosity, his vilification of all us SPs ~ or perhaps, variants of all three? And more to the point, did it confirm what you've always suspected of Scientology - ie. that it's weirder than you thought? What struck me the most about this, was not how bizarre and cult-like Scientology seems with its own little coded language, but rather, how very religious it seems. Religious as in zealot. Having said this, a couple of definitions are in order. When I talk about bizarre, I'm actually referring to the bazaar of acronyms and rituals associated with Scientology, from birth to death to the clearing processes that happen in between. Decidedly not normative. And when I reference 'cult,' what I mean by that is not simply "other people's religion" - although that is perhaps the most apt definer, given the derogatory denotations of brainwashing and 'wrong beliefs' that this conjure's up, and the simple fact that, at heart, all religions really are cults. Nor do I mean "a religious group which denies the essential doctrines of Christianity" although that might well be a popular belief. This latter definition, available online, cracks me up although having said that, when we refer to cults, we are almost always talking about new religious movements that are not just somewhat subversive and conspiracy theorist in their leanings, but rather, seem to almost invariably have a charismatic leader or prophet at the helm to aspouse the Truth, whatever that is. What I mean by cult is more so the extreme dogmatics that have little to no basis in pragmatics or what I would say is a practical way of being in this reality that we call life. I say this despite knowing that Scientologists do consider themselves to have found a perfectly workable worldview. But it seems to me, if you have to go through expensive Freudian pseudo-pychotherapy to 'clear' all your formative painful thoughts, beliefs and memories, chances are you're having to live a pretty twisted game of life from hereonin or heroin ~ or whatever kind of altered reality one has to ascribe to in order to get by. So if one has to construct an elaborate and imaginary religious labyinth in order to "do" life, I begin to question the stability of the philosophical ground upon which are built said myths and rituals. Granted, whether or not it's sound philosophy is in the eye of the spiritual beholder - if it works for them - amen and peace be upon them (except if "them" happens to be a member of my family - then egads!) - but the crux of the matter is that this, like all religions and all cults, is really about crux. That is to say, it's just another coping mechanism to deal with suffering. At their core, all religions are really theodical tethers that attempt to answer the age old question: how can this religion help me to better deal with and reconcile pain, suffering and evil in this world? So little surprise that Hollywood, if I may pick on Tinseltown types metanymically, has latched onto Scientology as a self-help haven. Not surprisingly, many actors and actresses first stumble through the Scientology Celebrity Center doors in need of drug and alcohol rehab. Scientology hears their prayers with Narconon. I've only read a cursory amount of L. Ron Hubbard's bio. It's enough to gather that he was a bit of an Aleister Crowley-type figure and that he was the antithesis of what he boasted. "Do as I say, not as I do." He was violently opposed to psychiatry and drugs, yet popped pills like crazy, or more to the point, because he likely was crazy. And his worldview seems decidedly gnostic such that cosmologically, evil not good prevailed. His ideas aren't complete hogwash to all, however, because he clearly has enough 'clear,' albeit considerably-poorer, thetans to show for his efforts. It's the prophets & profits thing all over again. His three decade old media quote may well go down in history: "If a man really wants to make a million dollars, the best way would be start his own religion." Indeed. My intent is not to dis Scientology or any religion specifically, so much as to call into question the sins and limitations of all religious constructs. There is a necessary evil inherent in all religions - why else who people purport to call themselves spiritual rather than religious? (I argue they are one and the same, but tomayto/tomahto in the garden of Eden). Huston Smith says this best, I think. "If you do not institutionalize your spirituality, it gets no traction in history. So if Jesus had not been followed by Saint Paul, who established a church, the Sermon on the Mount would have evaporated within a generation. So I think if we are serious about the spiritual life, we have to undertake the burdens of institutionalization -- and they are heavy." I'm reading a rather excellent book right now from which the above quote is lifted: Rational Mysticism: Dispatches from the Border Between Science and Spirituality. I like it because the author takes a stance that is firmly grounded in both reason and mysticism (famously deconstructed as "begins in mist, has an I in the middle, and ends in schism"). And while his views are far from the final frontier, he does reflect and refract his scientific lens in order to look closely at the innermost face of religion, experience. So while all of us Supressed Persons can sneak a peek at Tom Cruise's indoctrination video and snicker and snort, we do well to look turn the camera lens around and press record. My religion, if I may be so bold as to claim temporary ownership - Unitarian Universalism - has it's own fair share of ideosyncracies, starting first and foremost with the name, which is a mouthful in and of itself. I would be willing to guess that less than half of us UU types (eat your heart out, Tom: we have acronyms, too) could articulate who we are and what we stand for, in any less a logorrheaic fashion than Tom just did in this now-infamous video clip. We have our own cultic crosses and chalices to bear, too. Such is the path of religion. And yet, I dunno. I get scared when any religious adherent purports to have all the answers, especially when history has yet to reveal all the questions. Just as I get scared when I see that rantings like his becomes so much fodder for the anti-Christ crowd. This story will also, no doubt, feed many a crumb to the Dawkins, Harris' and Hitchens of this world, who believe religion to be an idle hobby for delusionists and dodos. Because to many people, all things antithetical to one's own worldview are prooftexts for absence of God, or similarily, that the devil is alive, well and spawning. It must be so, for the Pope announced plans recently to beef up his God squad of Exorcistors to help fight the spread of Satanism. I wonder if part of their training involves sitting around, eating buttered popcorn and watching old Exorcist tapes? And it must be so, or Huckabee might not have intentionally stuck his tongue entirely in the wrong cheek last month when he rhetorically questioned whether Mormons believe Jesus and the Devil are brothers in arms ~a veiled but obviously antichristological comment intended to provoke fear and contempt amongst his evangelical right followers. And it must really be so, because look at the desperate efforts the Church of Scientology is going through to clean up their image online and get this Tom Cruise clip off YouTube. Ultimately though, religion is as religion does (so help us, God), which is why atheism is seeing a neo-renaissance of sorts. Yup, it's apocalypse now time again, which explains maybe why all the aliens have been hovering over Texas lately. Looking for humanoids, mad heifers and Bush supporters ~ although not necessarily in that order ~ to beam up. Yeehaw and nanu nanu ~ may the force be with them. Normally I wouldn't be given to blogging about politics on my religion-only blog, but since the two are so incestuously entwined in this nation and in this Presidential race, my rant is apropos. Actually it's not a rant but a public prayer akin to the kind of desperate bargaining I used to make with the Big One when I was a kid: Please God, don't let Huckabee win. I promise I'll be a nicer person and I'll even pray more, even when I don't want things. The last thing this country needs is yet another Presidential hopeful from Arkansas with a name like Huckabee....it would do nothing for its public persona internationally, which is negligible at best. And the last thing this country needs is someone to further build the Theocracy. Besides, anyone who studied religion yet professes to not be entirely sure if Mormonism is a religion or a cult. It's frightening to say the least. And I'm not just saying all this because I'm an Obama fan. And because I think Obama gave a brilliant speech last night, even if he was a little heavy on the rhetoric. I can't vote anyways. And I just found out that because I wasn't born here, I can't run for President. Which is a good thing anyways. My religiosity would be called into question and even I would be hard pressed to define it.